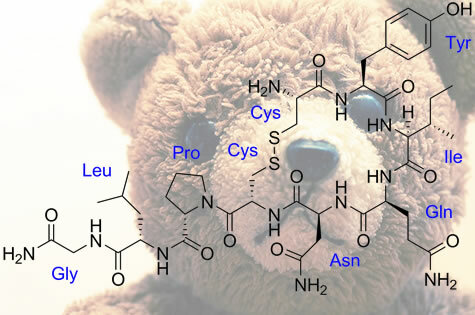 Who doesn’t like oxytocin? Who could dislike any substance referred to as a cuddle chemical? The answer may be you, if you are not in with the crowd feeling the effects of the hormone. Carsten de Dreu and a super-long list of co-authors (listed below), have administered oxytocin to experimental participants and validated its bright side (cooperation among people in a group), but uncovered its dark side (defensive aggression towards people in other groups). Read all about it. Carsten K. W. De Dreu, Lindred L. Greer, Michel J. J. Handgraaf, Shaul Shalvi, Gerben A. Van Kleef, Matthijs Baas,Femke S. Ten Velden, Eric Van Dijk, Sander W. W. Feith. (2010) The Neuropeptide Oxytocin Regulates Parochial Altruism in Intergroup Conflict Among Humans. Science, 328(5984), 1408 – 1411. Oxytocin and defensiveness was written on June 24, 2010 and filed in Articles,Encyclopedia,Research News.